LONDON (Reuters) - Demand for online courses and virtual schools helped British education publisher Pearson to overcome weaker textbook sales in the United States and remain on track for a return to profit growth in 2018. Wednesday's nine-month trading update provided a relief for investors, as the group earns around 80 percent of income in the second half of the year. Pearson's shares rose as much as 7.7 percent, following pressure on the stock ahead of the statement. The British company has been through a tumultuous few years, with Chief Executive John Fallon forced to cut thousands of jobs and sell assets such as the Financial Times newspaper to fund a move into ebooks, rental schemes and online courses. Fallon said that strategy was now paying off while pressures in the United States, where students are renting and downloading courseware rather than buying books, took less of a toll than feared. "We're investing to make sure we emerge as the winner in digital learning," Fallon told reporters. "There is still a lot to do, but we continue to make good progress in building a stronger and more sustainable business." 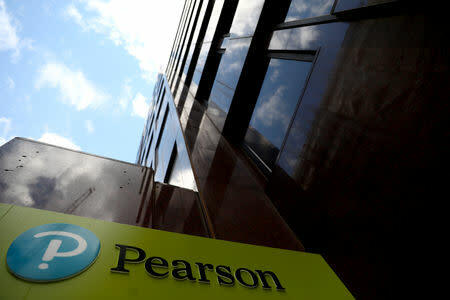 At 0750 GMT, Pearson's shares were up 3 percent, adding to a 27 percent rise recorded in the last year. With students changing the way they buy books in the United States, the group has ramped up its expansion into new areas such as providing online academic programmes and supporting virtual schools that are used by home-schooled pupils or those who want to learn subjects not taught at school. Fallon believes Pearson will have a more stable future if it builds ties directly with students and institutions through subscription models. "It expands our addressable market," he said. About 50 percent of its higher education courseware sales were digital last year and that is expected to grow further. That focus on growth helped to move the spotlight away from the U.S. higher education courseware business, where revenue fell by 3 percent as it sold fewer textbooks. That was at the top end of analyst forecasts and came despite delays with a new software rollout that should be reversed in the final quarter. "Arguably even more importantly, the group has confirmed its market share is still in the 40.0 percent to 41.5 percent range," Citi analysts said of the U.S. unit. "This is an undeniably good outcome and leaves 2018 forecasts largely derisked, in our view." The group reiterated its target for 2018 adjusted operating profit in a range of 520 million pounds ($685 million) to 560 million pounds. It says this represents growth when stripping out the impact of disposals, the first improvement in six years. The British group also expects a one-off tax benefit and resulting lower finance charges to boost 2018 adjusted earnings per share into the range of 68 pence to 72 pence, compared with a previous forecast of up to 53 pence.